The surveillance data from this system is used to direct actions to identify areas of infection control that need improvement and measure progress of prevention efforts toward reducing HAI through the process of conducting Infection Control Assessment and Response (ICAR) and Targeted Assessment and Prevention (TAP) strategy. The key measure that is used to track HAI is the Standardized Infection Ratio (SIR). SIR is a risk-adjusted summary measure, a ratio that shows both direction and magnitude. It compares a health care facility’s observed number of infections to the predicted number of infections based on 2015 national aggregate data. 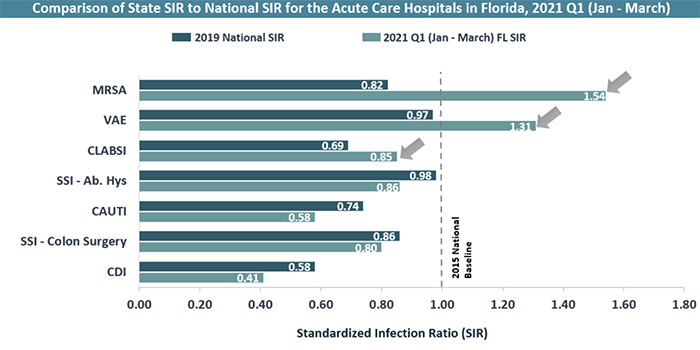 Under the new 2015 re-baseline model, the risk-adjusted measure SIR, specifically predicting infections for each facility, is computed using the data that a health care facility submits each year in an annual survey. The number predicted is risk adjusted to account for differences in health care facilities and allow for a measurable comparison. The U.S. Department of Health and Human Services (HHS) proposed new targets for the national acute-care hospital metrics for the National Action Plan to Prevent Health Care-Associated Infections: Road Map to Elimination (HAI Action Plan) in October 2016. How does the State compare to 2016 National SIR? Note: Above data is a representation of those acute care facilities reporting to meet Centers for Medicare & Medicaid Services’ (CMS) Inpatient Quality Reporting (IQR) program for reportable HAI types. 2017 and 2018 ( January – September ) FL SIR does not include data of the U.S. Department of Veterans Affairs (VA)/ Military Hospitals (10 facilities) that the state does not have access to under the Data Use Agreement (DUA).